On the eve of Bedding Out, there’s mounting excitement in the twittersphere and my stomach is looping the loop. Will the work do something? (Will my body do what’s needed?) Will people join in and make the project work? I am back at the eve of my Fourth Plinth performance in Trafalgar Square. Then, it was the uncertainty of performance that proved its power. Then, it created a starting point, a moment, where the onlooker was confronted with questions and a place where other campaigners and activists could gather anduse the opening it provided. I remember then, as anxiety created its own momentum, stopping it from running out of control depended on my returning to the why: the absolute essence of what I am doing. It was there that clarity lay, and the guts to see it through. It is the peddling of myths about disabled people and those in poverty that bear no relation to our lives as they really are. It is the notion of us, in and out of paid work, as feckless and shiftless, fraudster and scrounger, as workshy and morally bankrupt that ignores the many influences of a person’s capacity to work and sets us aside as ‘other’. It’s the use of those myths to justify cuts and introduce a system of benefits that ensure those who most need support are most likely to fall through the gaps. It’s the way those myths link to soaring hate crime, distress and even suicide, and yet are exploited for political gain. It is the way we must edit ourselves to stay safe. It’s the lie that austerity is caused by us when it comes out of inequality, and it’s the way that inequality only magnifies with government policies like these. It’s the way disabled people were the first, virtually unreported for the first two years, but we were never going to be the last. Now it’s unemployed people, poor people, single parents, immigrants, the under-25s; next it is to be people deemed to be earning too little. It’s the way that even as the poor are punished by income cuts, the rich are rewarded with income tax cuts and corporations with tax evasion condoned. It’s the way that good people are swayed by lies, or distracted by their own struggles, or silenced from speaking out for fear they could be next, or intimidated by increasingly aggressive suppression of protest. It’s the way that government policy, and the absence of opposition, threatens our futures, the way that it confines and divides and degrades us all. It’s the way that it punishes non-conformity, says we are motivated only by greed, unravels 30 years of disability progress, undoes democracy. It’s the knowing that there are better ways of working and contributing and living alongside each other if only we care to look. And it is the way some of us have banded together – in Disability People Against the Cuts, Spartacus, Black Triangle and more – in a sustained campaign of answering back. It’s about the awe I feel at the strengths that have emerged: the skills and strategies, alliances formed, deep compassion and resilience, and at new ways of campaigning from home and sofa and bed. It’s about the possibilities of all the different individuals and groups joining forces to create an opposition. It’s the way that a gathering momentum could yet create a collective and unequivocal cry of ‘Not in my name,’ until politicians of all parties realise they have no choice but to heed us. Which is also about hope and becoming part of a much bigger decision to shape a future that is so much better. So that’s why. In Bedding Out, I am portraying a human story in its broader political context. It’s about combining with all the other voices to create a very different story of what it is to be us and to feed into the debate about what kind of society we want to be. In the words of John Lennon, adapted, let’s start a revolution from my bed. On the web:Bedding Out will be live streamed throughout the 48 hours at www.roaring-girl.com. 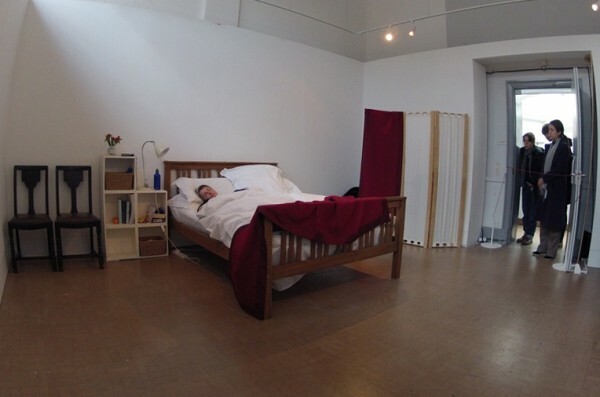 Bedside Conversations will be live streamed with audio, BSL interpretation and live subtitles. Follow @RGPLizCrow and use the #beddingout hashtag to take part throughout the 48 hours. Join our Twitter-based Bedside Conversation on Thu 11 Apr at noon. Anyone not on Twitter can text us: 07784 899514 and we can upload what they say to Twitter. Typing ‘MySecret’ before the message ensures that their message will be tweeted anonymously. Members of the public gather round the bed to talk about the work, it’s background and its politics.